When survey data indicated that students did not feel safe in their own community, Pueblo City Schools’ (PCS) Maria Fieth convened a task force to consider how to respond. The task force then created the Safe Haven for Bullying Victims Project. 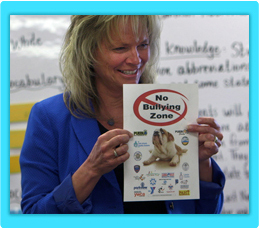 Safe Haven gathered input from more than 700 students on the design of posters denouncing bullying and then enlisted business owners to hang the posters in their windows. The posters alert students that these businesses will provide a refuge for them if they are being bullied or feel unsafe. The business owners agreed to help youth arrange for someone to pick up any students who are being bullied and to let them wait until a safe ride arrives. The owners are also educating their staff members about bullying and how to help youth involved in bullying. To gain initial support for the project, Safe Haven enlisted PCS partners, including community organizations, local leaders, and School Resource Officers, and then pounded the pavement to engage businesses. Local TV, radio, and print media also helped spread the message. The response from business owners has been overwhelmingly positive. Approximately 200 businesses in the PCS area have joined the project. In addition, Safe Haven produced a four-minute video describing the project and how to use the Safe Haven resources, which has been viewed by more than 23,000 students. During the first three years of the Safe Haven project, the number of students who reported bullying another student two to three times per month or more in the past couple of months decreased by 34% in the elementary schools, 18% in the middle schools, and 10% in the high schools. Having adult business owners model how to protect students who are being bullied seems to have spread to students. Recent data show that when asked, “How do you usually react if you see or learn that a student your age is being bullied by another student?”, the number of students who reported that they “try to help the bullied student” increased by 21% in the elementary schools, 42% in the middle schools, and 21% in the high schools.